Sarah Laurenson takes a break from the chaos of the Edinburgh festival to become immersed in an exhibition that transports the calm beauty of the Outer Hebrides to the heart of Scotland's capital city. It takes double the time to get anywhere. You frequently end up being shunted off the kerb into the path of oncoming buses and bikes, left to the mercy of drivers and cyclists on the verge of road rage. Then there's the constant bombardment from pavement performances: pipers playing the Star Wars theme tune, a brass band covering ABBA, some African drums, and a tone-deaf busker thrown in for good measure. This is Edinburgh in August. Exhausted and in need of caffeine, I arrive at the door of Dovecot Studios. 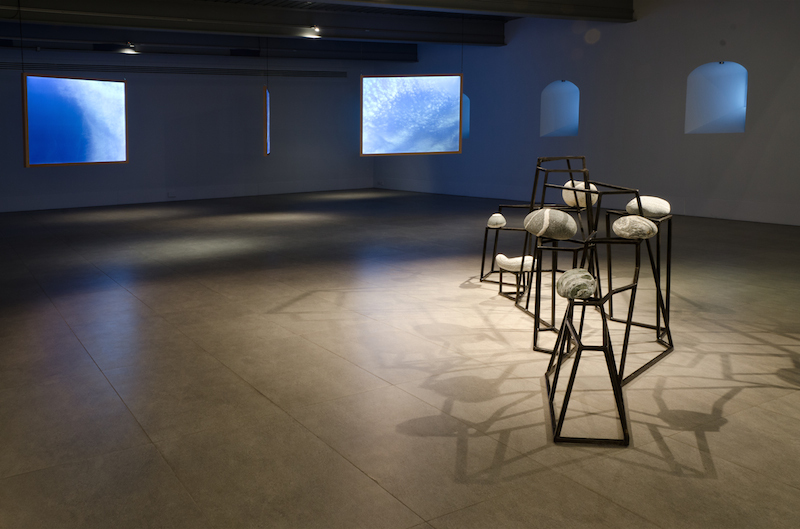 Inside, I find myself in a haven of calm and tranquility in the exhibition Tumadh: Immersion by Dundee-based environmental artists Dalziel + Scullion. Their work explores 'the ecology of place' and 'mankind's relationship with nature'. Leaving behind the madness outside, the serenity is almost hyper-real and encountering it feels like a relief, like closing your eyes and taking a big deep breath. The exhibition has been designed and curated to speak to the urban environment that surrounds it, and to a partner exhibition at An Lanntair in Stornoway. It advocates a more sensitised connection with the world around us, with landscape and nature and elemental forces. You enter the gallery and come up behind four figures, soaked in soft light and staring out into the distance as if taking in the view from the top of a hill. 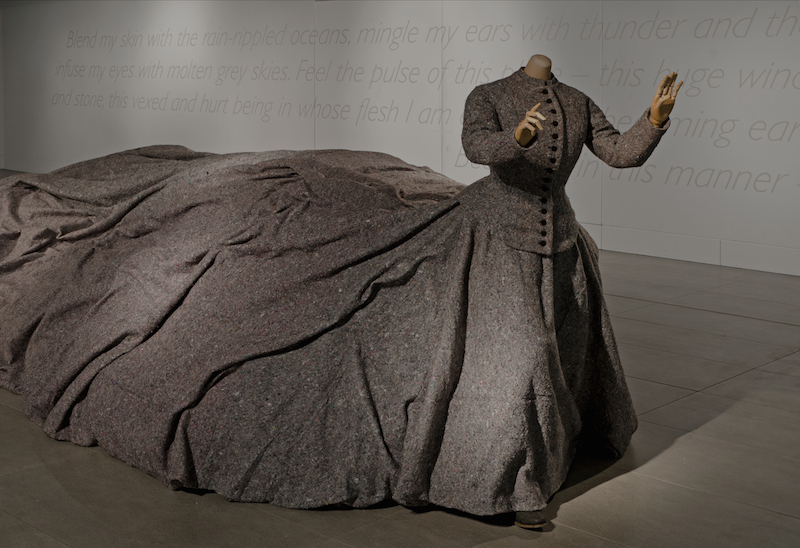 An enormous skirt flowing across the room puts you in mind of a crumpled, dimpled, mountainous landscape. These garments instead encourage immersive natural experiences, for example a rain jacket that has a hood which is open to the elements and only allows you to look up so that you can focus on the rain falling on your face, and another with a padded back that allows you to lie down in rocky landscapes. 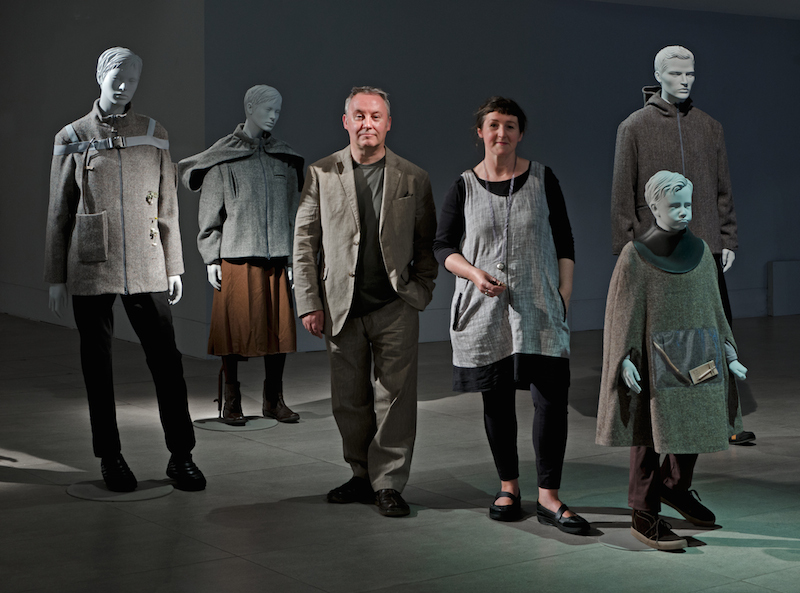 Inspired by the relationship Tweed has to the landscape of Lewis and Harris – Dalziel + Scullion explore how the tactile and physical qualities of textile can mimic and enhance the feeling of immersion in the natural world. 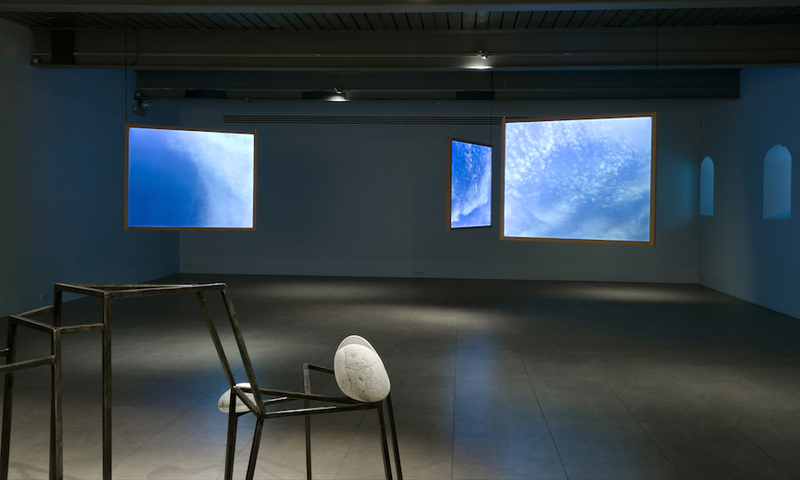 The origins of the materials and their production in Lewis and Harris, together with a display of rocks from the islands, creates a dialogue between city and island. The on-going thesis throughout their practice is to do with our increasing dislocation from the natural world and that real immersion in nature requires active concentration and involvement. This is something that the they aim to guide us towards, with this show in particular concentrating on how textile and clothing can both reflect natural spaces and dictate our experience of it. This is a minimalist show packed with big ideas. It fuses craft, art and design, and offers a considered and thought-provoking exploration of the relationship between the things we wear - materials, design and making - and the places we wear them. But this show isn't just about pondering abstract notions about man and the world. It also presents practical tips, from being aware of your body and your breathing to carrying a nature diary, to collecting feathers and stones. A gathering bag is available to buy and make, which challenges visitors to take some of their ideas on board and put them into practice. Perhaps most importantly, the conversation between urban and rural, together with the links between the two exhibitions in Edinburgh and Stornoway offer a rare example of a real partnership between the arts in Scotland's big cities and the arts in Scotland's islands. 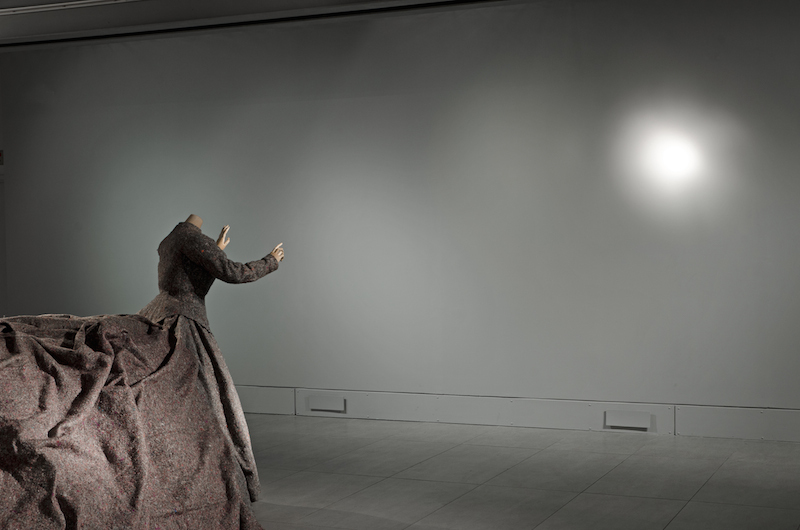 The exhibition is part of GENERATION, a collaborative project between various arts organisations and venues, led by National Galleries Scotland, Glasgow Life and Creative Scotland. There is often a hint of condescension underlying projects run by centralised organisations which claim to make links with, or 'celebrate', the arts outside the central belt and surrounding area. But this is certainly not the case here. Dalziel + Scullion, together with the Dovecot, brings the island into the city, and vice versa through the sister show at An Lanntair. The Edinburgh exhibition captures a particular draw of the islands: the paradoxical feeling of freedom they can evoke as a result of being isolated, cut-off and hemmed in by open water. The works represent Scotland's landscape in a way that is neither romantic or over-wrought and they project the feeling of being the product of a mutually beneficial relationship, underpinned by a genuine respect for the natural beauty, and a shared passion for the arts, of Scotland's islands. How refreshing. Tumadh: Immersion runs at Dovecot Studios, Edinburgh until 13 September 2014 and at An Lanntair, Stornoway until 30 August. All images copyright Michael Wolchover. Sarah Laurenson has edited two textiles books and is currently studying for a PhD at the history school of the University of Edinburgh. She blogs at www.reformlane.co.uk.